LOWER MANHATTAN, NY— Major League Baseball launched the MLB Fan Cave in 2011 with the objective of having two super fans watch every single baseball game for each of the 30 professional baseball teams. For the 2012 season, MLB redesigned their central space in Lower Manhattan and launched a new process to select the “cave dwellers”, better known as baseball super fans. A pool of 22,000 applicants was filtered down to 30 finalists. From the 30, nine were chosen to be this season’s Cave Dwellers. During the season, the nine members use blogs, videos and social media to interact with fans as well as share their experiences. A new challenge for the Cave Dwellers this year is to compete in various tasks with each other with fans voting online to help decide the winner. Currently there are three members remaining in the cave. One member will be crowned winner at the end of the World Series. The Fan Cave is a unique branding and marketing development from Major League Baseball. The 15,000 square foot location that was formerly a Tower Records is now completely wired for the 21st century. There is a constant stream of baseball on multiple HD TVs, in addition to games, cameras, art and other forms of interactive media. While the Cave’s primary focus is on baseball, it blends pop culture, media, art and social causes. In particular, the Stand Up To Cancer initiative has partnered with MLB on numerous occasions by filming commercials at the Fan Cave. Many of MLB’s athletes, such as Bryce Harper and Justin Verlander have visited the cave as well as celebrities, personalities and bands. 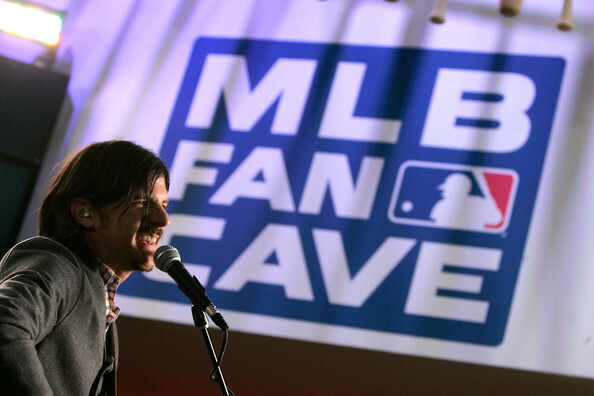 Musical artists such as The Script, Neon Trees,and The Avett Brothers have performed at the Fan Cave. Performances have helped Major League Baseball expand their platform beyond baseball to non-baseball fans and are free to the public. The emphasis on social media has helped the Fan Cave to spread their influence. Apart from the Cave Dwellers tweeting and blogging regularly, members of the general public often tweet their photos or videos from concert with hashtagging "#caveconcerts." People don’t necessarily have to be baseball or sports fans to visit. The concert series in particular is an opportunity for New Yorkers—baseball fan or not—to have the chance to see bands in a more intimate setting. The Fan Cave is open to the public on weekends.